More isn’t necessarily always better – work, dirty dishes, ants. Not all people like getting super high, and if you fall into that category, microdosing might be a better option for you. Less is more when microdosing. It elevates euphoria and promotes well-being while preventing paranoia and an empty wallet. Microdosing is also a beneficial creative instigator, a way to put pen to paper or give you a lift at work. I’m the kind of person that documents life events by journaling. I have my fair share of journals I keep solely for the purpose of writing down my profound and wild ideas while under the influence of cannabis. Often times, these detailed documentations are illegible or disconnected because my brain tends to think faster than my hand can write, and with the uncoordinated effects of too much THC, whole words or thoughts are missing from each sentence. My intentions were valid, though they were not executed optimally. A few hits from a rolled joint or just one bong rip will start to stimulate these creative juices far beyond the ability to document them functionally by hand. The ease of the vape pen gives me control over dosage, and therefore, I discovered the benefits of microdosing. Microdosing is the process of consuming the least amount of cannabis while still achieving its therapeutic effects. The balance occurs in a small window of opportunity, toking only about 1-5 times (depending on your tolerance). People have reported feeling relaxed, calm, less pain and less anxiety while still being fully functional and sometimes even more light-hearted. To achieve microdosing, the vape pen is best for more controlled doses and experimentation, since you usually only need a few tokes. With a joint, just one toke could ruin you. And, unless you are meticulously cautious about measuring out the amount of cannabis used in your joint, you won’t be able to conduct controlled experiments on the strains and dosage that work best for you. A common misconception is that more will cure more, but cannabis consumption has a sweet spot where at some point the maximum benefits have been achieved and more just becomes more detrimental. Without the exaggerated effects of THC, daily tasks are still possible and usually more enjoyable. More and more people are finding that by incorporating a bit of cannabis into their work and everyday life they become more productive. Similarly, athletes find that small doses of cannabis enhance their endurance while they train. If the dose is so low the high is virtually undetectable to the outside world (i.e. no anxiety or awkwardness), and with a vape pen even the odor is discrete, chances are you are reaping just the right amount of benefits. What’s great about microdosing is that you don’t have to commit to just one strain – you can try them all in one day. A few hits here and there will give you a good sense of how your body feels with said strain. It’s like buying a pair of hiking boots – that is why there are so many of them. Different types of feet need different types of support and options. It is never a one-size-fits-all product. A safe bet, though, is always some Sour Diesel. Try two hits and get into something creative. Take notice if you feel more motivated or less distracted, and evaluate your levels of content. Music is a great outlet for cannabis because it often requires concentration and repetition. With a great focus on the task at hand, you might feel less inhibited to attempt a random jam session, letting what comes natural flow through your guitar strings. I don’t play guitar but I try my hand at learning chords. I find my attention and retention is much more durable with a small toke of Candyland. Coloring is often an easier approach to a creative outlet. 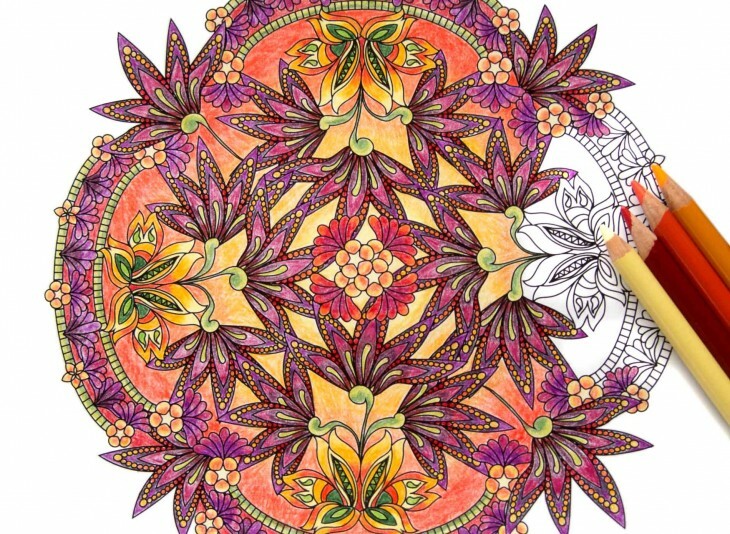 Mandala coloring books are found in every bookstore and offer intricate patterns that can take an attention to detail or a free-spirited approach to coloring in the empty space. I enjoy an indica like Cherry Pie that pulls me into one task, putting blinders so I can disconnect from the rest of the world. Creativity can even be approached in the form of exercise. Low-dose toking has been helping many athletes enhance their performance with a little extra lift of sativa-filled encouragement. A small amount of Durban Lime can be all you need to give you the power boost to run that last mile or push through a heavy-weight set of reps.
For me, microdosing is an essential tool for writing – at least getting my ideas on paper and then editing sober. The younger version of myself had the right idea but the wrong method. Now, I take a notebook and pen everywhere I go. Microdosing allows me the ability to cohesively jot down my thoughts and conduct conclusive ideas. I find my best work coming from self-reflection (Link to Coastal Cannabis) after a few hits of OG Kush. Strapping down ideas that soar.